I remember using Horizons when I was in school. Sis is starting kindergarten this year, and we needed a math program for her. When I realized we would have the opportunity to review Horizons Kindergarten Math Set from Alpha Omega Publications, I was really excited! Sis was, too! 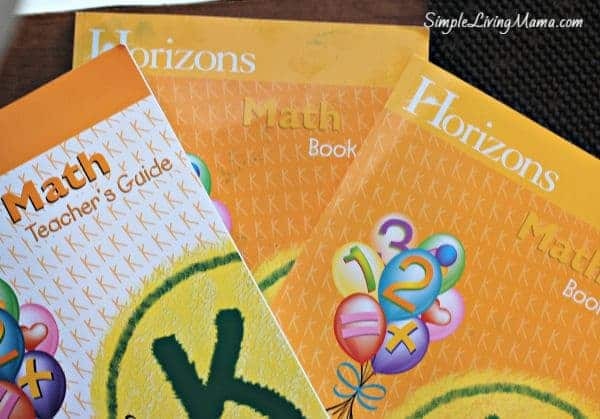 The Horizons Kindergarten Math set came with two student workbooks and one teacher’s guide. The teacher’s guide is very thorough. The introduction explains the goal of the curriculum, how it is designed, the development, how several of the best methods are used in the curriculum, an example, and general information. Student lessons are designed to be completed in 25-30 minutes. 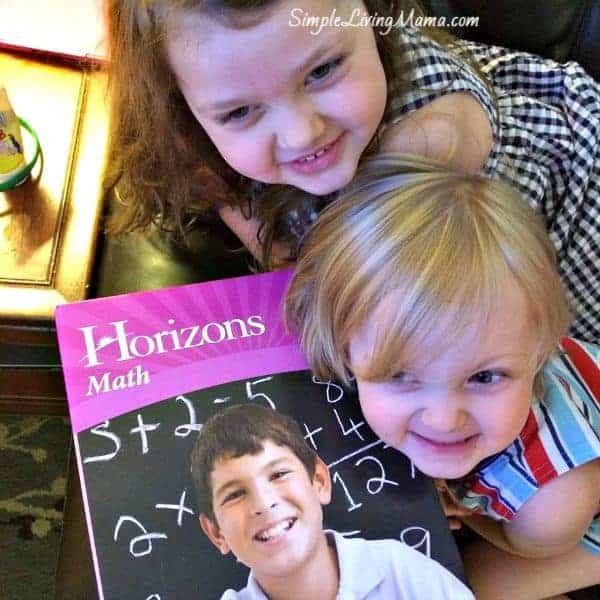 With Horizons math curriculum, you will find that concepts are introduced and then reviewed for one week after the presentation. For the next two weeks, the concept is then presented again for a couple of lessons. The concept is then reviewed ever couple of weeks. There is plenty of time for the concept to be reviewed until is mastered. The teaching lessons are organized in a way that is so easy for a parent to teach. There’s an overview, materials and supplies list, teaching tips, activities, answer keys, and there are also extra worksheets in the back of the teacher’s guide that can be duplicated. There are a total of 160 lessons. 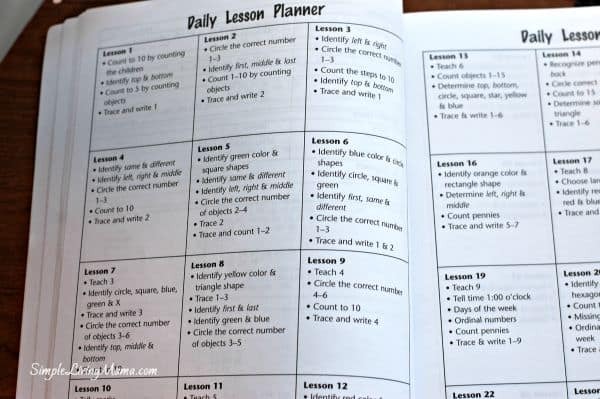 The Daily Lesson Planner at the front of the Teacher’s Guide gives you an overview of everything you are going to teach each day. I set Sis up with one lesson for each day we did school. Most of the materials are simple. She just needed a pencil and a crayon. Occasionally we would need something more, such as objects for counting. I sat down with her with the teacher’s manual and read over what I needed to teach her. Then we worked together on the lesson. The bright colorful workbook really attracted her to the lessons. I don’t think she has ever been so excited to do a workbook page. Even though many of the first lessons were over concepts she already knew, it was great for her to review and for me to see exactly what she knew. 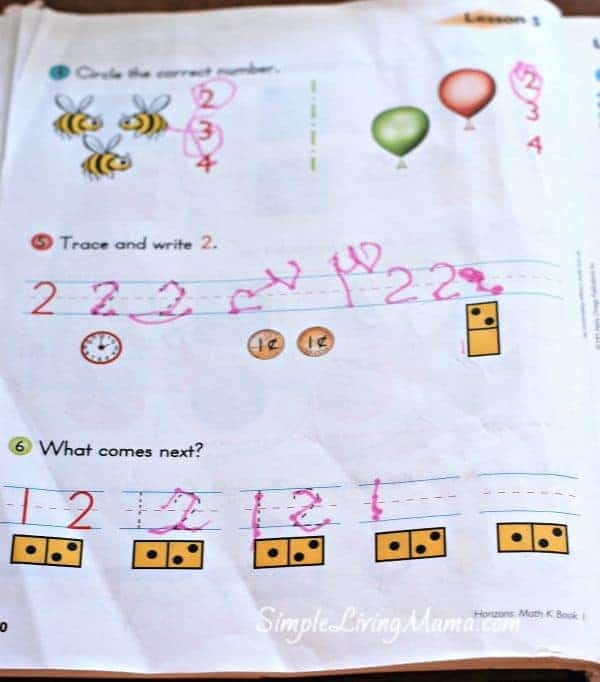 I liked how the teacher’s manual made teaching math so easy for me. The Daily Lesson Planner gave me an overview and each lesson broke it down for me. Math is a subject I’m not crazy about, so the easier it is for me to teach, the better. Yes! We plan to completely finish the program. If it goes as well as it has gone so far, we will continue on with the first grade set. If you want to take a traditional approach to teaching math, check out Horizons. We have loved it so far!